An estimated 10 percent of Americans involuntarily clench or grind their teeth – a condition known as bruxism. This common disorder can lead to a host of unpleasant side effects that negatively impact health and quality of life. Until recently, most people who suffered with bruxism had one of two choices: wearing a bulky mouthguard during sleep or trying their luck with anti-inflammatory medications. However, the findings of a new Botox study may change the future of teeth grinding therapy. The research, published in the medical journal Neurology, found that Botox injections helped improve bruxism in participants who suffered from severe teeth grinding at night. This is promising news for the thousands of people who experience bruxism-related earaches, headaches, jaw soreness and other physical complaints. Unsurprisingly, chronic teeth clenching is also associated with serious dental problems including increased tooth sensitivity, enamel loss and progressive wear and flattening of the back molars. While the exact cause of unconscious teeth grinding is still unclear (stress is a known factor), medical experts do know that bruxism is connected to both functional and aesthetic concerns. Both day and evening teeth grinding can result in temporomandibular joint (TMJ) disorder and hypertrophy of the masseter muscle, which often lends a masculine, square-jawed appearance. Botox is a cosmetic injectable that stops muscles from contracting. 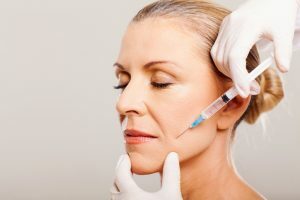 Although its applications are increasingly far-reaching, Botox is perhaps best known for its ability to banish facial expression lines, especially those around the eyes and forehead. Based on this same principle of muscle-relaxing action, researchers injected Botox into the jaw muscles of bruxism sufferers, and the results were encouraging. In the study, 22 patients – all of whom suffer from teeth grinding— were monitored at a sleep lab for severity of bruxism symptoms. Thirteen of the patients were randomly chosen to receive Botox injections in their jaw muscles and the rest received a placebo. While additional large-scale studies are needed to establish the efficacy of Botox for bruxism, its cosmetic, rejuvenating potential is well established. Botox is the only injectable that has won FDA approval for treating moderate to severe forehead lines, crow’s feet and glabellar lines (“worry lines”) and has been praised for its wrinkle-smoothing effects for years. Botox is the wrinkle treatment of choice for good reason. It’s safe, non-invasive and delivers amazing results that last up to 5 months. Interested in refreshing your appearance with Botox? Dr. Thomas Loeb is an expert in cosmetic injectables that give beautiful, natural results. Reverse the signs of aging by scheduling a private consult with Manhattan surgeon Dr. Loeb, a leader in plastic and reconstructive surgery.